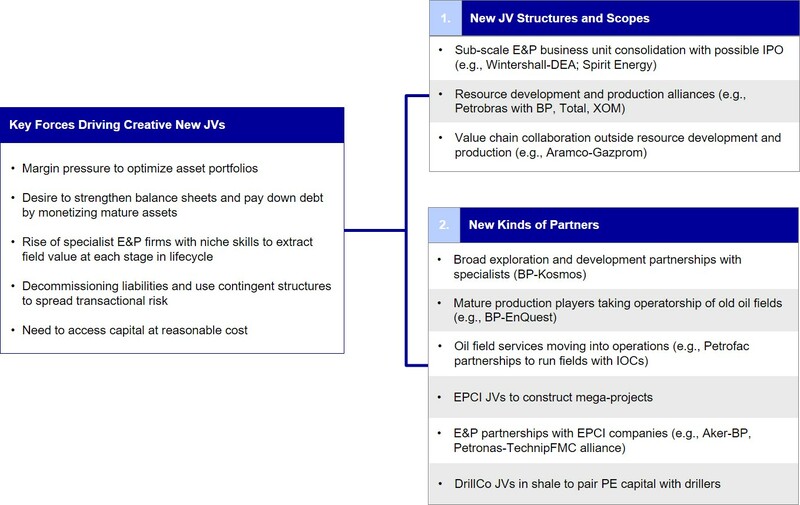 In the energy arena, JVs have long been a very successful transaction structure, especially to mitigate risk. In areas where there are very sizeable investments – in the realm of multi-millions and billions of dollars – it’s a good approach for energy companies to come together and manage their risk jointly. In the last couple of years there have been some pretty interesting trends: the downturn in crude oil prices is making people reconsider the approaches that they are taking and, as it relates to JVs, recognizing that JVs can be a very efficient vehicle to achieve their strategies at a low capital rate (Exhibit 1). Some atypical partnerships are coming together, like an announcement from a couple of days ago by Carlyle Partners to come together with Port of Corpus Christi Authority to build an oil export terminal. Carlyle Partners is not a direct terminal operator, but they see the space as something where they can make a good investment. There have also been some interesting developments in the renewables space, where you have traditional oil and gas fossil fuel people partnering with emerging technology players to develop new renewable energy jointly. In my opinion, today’s political rhetoric is almost more fodder for conversation among deal teams, and frankly when you look around the globe there is political rhetoric just about everywhere. In that way, it can afford you an opportunity to rise above that rhetoric and go back to the strategic vision you’ve developed with the potential counterparty. Separately, the regulatory environment also has a profound impact on deal structures – the recent U.S. tax reform [The Tax Cuts and Jobs Act (TCJA)] caused many companies to reconsider the structure of their global deals. Dealmakers also have to recognize there may be geopolitical friction between their and their partners’ host countries and have to avoid falling into those political paradigms during negotiations. Regulations outside of the U.S. also matter. Changes in Chinese regulations, such as the new 10% tariff imposed on U.S. LNG exports to China, could also have interesting implications on JVs in the oil and gas world. Some of these regulatory or tariff changes can prompt evolution in the LNG trading space. One interesting implication is that traders can choose to swap those cargos, as from a Chinese trading desk standpoint, U.S. LNG transported on a European or Australian storage tank, would no longer fall under this tariff. You could see swaps happening within companies that have JVs in other parts of the world. That commodity until now has not been extensively traded around the globe, nor have there been clear trading hubs, unlike West Texas Intermediate (WTI) Cushing, Brent Crude, or Henry Hub Natural Gas. Mike additionally commented on how he’s seen JVs used to advance breakthrough technologies for natural resource companies. His own company, Chevron, has recently signed data deals with Microsoft and Google, as have other peer companies like Equinor, Total, and Repsol – collectively worth billions of dollars collectively. Someone outside of energy or oil and gas arena might associate fossil fuels with really old technology. That’s not necessarily true – though there is an amazing amount of technology historically, and it has been traditionally focused on core activities like exploration, production, refining, and transportation of hydrocarbons. We’re now seeing great applications of data mining, advanced robotics to improve our operations, and analytics to help us understand how our largest generator units are performing. Plant preventive maintenance is also an area of focus for these new technologies. There’s been a tremendous amount of headway in this area, though it is one where you’ll see slight deviations from core O&G competencies because often the people who are building these technologies are not specifically gearing it for the oil and gas industry. As a result, you will see joint ventures, partnerships, alliances, and generally a more agile approach, to access and collaborate with emerging technologies, testing and trying them out, and – if things don’t work out – preserving the option to move quickly on to something else. As you’re going into any type of JV arrangement, you need to understand your partner very well, so that you know what is driving their company, how they think, what they are looking for, and why they are looking for it. Sometimes emotions can get heated during the negotiation process, so you need to be able to set those emotions aside, and assess the implications – meaning, is this something that will cause this deal to break, or is it an indication that this will be a high-maintenance, complicated arrangement to manage over time? Like Stephen Covey says, you have to begin with the end in mind – make sure you understand what you are trying to accomplish through this potential partnership, make sure you get the right partner, and then just be ready – because no matter how much planning you do in any kind of negotiation – you will get some curveball or surprise. Your ability to adapt and identify root causes of those issues is what’s important. For more on Water Street’s perspectives on effective partnerships in oil and gas, click here.